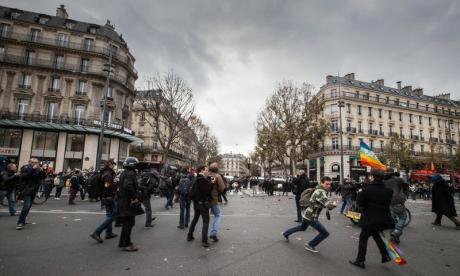 Despite the state emergency in France many decided to join the Climate March and challenge the interdiction to demonstrate. Demotix/ Marie Boyard. All rights reserved. Not since the Algerian War more than a half-century ago has France imposed such sweeping emergency powers. In little more than two weeks since the Paris attacks, French police have carried out well over 1,000 raids nationwide, busting open doors, hauling away scores of suspects without warrants—and even using their new counterterror laws to clamp down on climate-change protesters. In the United Kingdom, where Parliament may vote this week on starting airstrikes against the armed extremist group Islamic State (also known as ISIS) in Syria, hate crimes against Muslims are on the rise. In Belgium, where the Paris attacks were hatched, the country remains on alert, and the prime minster has proposed measures such as electronically tagging youths the authorities fear will travel to Syria, and telling imams what to preach. In the United Kingdom, where Parliament may vote this week on starting airstrikes against the armed extremist group Islamic State (also known as ISIS) in Syria, hate crimes against Muslims are on the rise. In the United States, calls are mounting to ban data encryption and bar Syrian refugees. Canada’s new Liberal government will let in some Syrians, but only if they aren’t fighting-age heterosexual males. Responses to the Paris attacks, whether based on the rule of law or sinking to the lowest common denominator—such as Donald Trump’s call to reinstate the form of torture known as waterboarding—will be test cases for leading democracies. The urge to respond assertively is natural; governments are responsible for keeping their people safe. But while extra protective measures may well be needed, it’s critically important not to let reactions cross over to the dark side as they did after the September 11 attacks. Arbitrarily targeting Muslims, disproportionately restricting freedom of movement, religion and speech, and subverting the rule of law will only feed the ISIS recruitment narrative. They also make it easier for other governments to justify abuses in the name of security. As they weigh reactions, France, the United States and other democracies would do well to consider the latest Global Terrorism Index, an annual report by the Institute of Economics & Peace. The report defines terrorism as the “threatened or actual use of illegal force and violence by a non-state actor to attain a political, religious, economic or social goal through fear, coercion or intimidation”. The index shows that despite a troubling global rise in terrorism in the past 15 years, attacks on the west remain exceedingly rare. Indeed, it says that the 37 people killed in terrorist attacks in 38 western countries last year only accounted for 0.1 percent of the worldwide toll. Though the western toll will be higher this year, it is likely to remain a tiny fraction of the total. Arbitrarily targeting Muslims... will only feed the ISIS recruitment narrative. Worldwide, the toll from all forms of murder is 13 times as high as from terrorism alone, and the economic losses from violent crimes is 32 times greater, the report says. In some democracies, like the UK, zero people were killed in terrorism attacks on home soil last year (compare that to the 1,730 people killed annually on Britain’s roads). The terrorism index also notes that most of the attacks in the west in the past eight years were the work of far-right fanatics, nationalists, supremacists and others with no link to armed Islamist extremism. Nor was ISIS, which claimed responsibility for the Paris attacks, the deadliest armed extremist group; that dubious distinction went to its Nigeria-based affiliate Boko Haram. Western governments should also pay close attention to the report’s finding that the countries with the highest rates of terrorist violence—including Syria, Iraq, Nigeria, Pakistan and Afghanistan—are plagued by government abuses including corruption, summary executions, political imprisonment, torture, and ethnic and religious discrimination. This suggests that one effective way for western governments to keep their people safe is to press for fundamental reforms in countries where armed extremists thrive, rather than subverting democracy at home.